Reddit Inc.’s decision to allow Tencent Holdings Ltd. onto its shareholder list has the U.S. bulletin-board social-media site aflame with criticism, backlash and Winnie the Pooh memes. If you’ve never visited Reddit before, click here for a video and discussion of Tank Man who famously stood up against China’s military during the Tiananmen Square crackdown, or slide over here for a meme about Christopher Robin’s beary friend and the president of China. Now pop on over to any Tencent property – QQ, WeChat, Tencent News – and try searching for those same topics. That’s Reddit versus Tencent in a nutshell. One exists to give near boundless voice to all and sundry, the other’s purpose is to connect people, companies and money under the watchful eye of one of the world’s most restrictive governments. Arguing that a single-digit percentage stake in Reddit will allow Tencent to rein in vociferous Redditors is a disservice to the U.S. site’s community. After all, this is a place that was brought to heel four years ago when its own moderators decided to protest the firing of a company executive. Reddit isn’t Tencent’s first foray into Western companies. It’s a major investor in Tesla Inc., Spotify Technology SA, and Snap Inc. – the latter two being prominent purveyors of content. And yet, Tencent’s move into those companies didn’t elicit any gnashing of teeth. 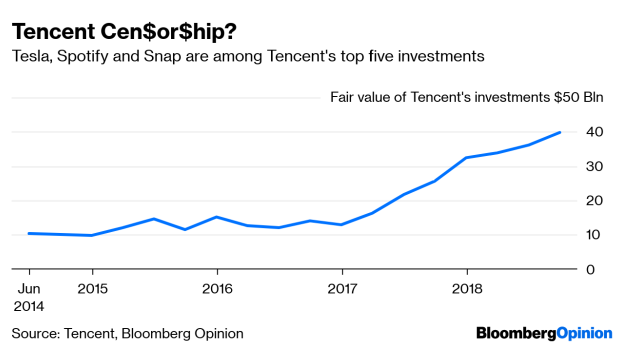 I’ve yet to see evidence that Snaps are being curtailed because Tencent holds 14 percent of the stock. On the flip side, Tencent’s investment of less than $300 million(1)makes Reddit less than 0.8 percent of the Chinese company’s entire investment portfolio. Tencent’s expertise in video games – it makes $15 billion annually from the category – is one reason the two got together, Reddit chief Steve Huffman told CNBC. I’m willing to take that statement at face value because Tencent’s overseas investments are largely strategic and mostly innocuous – it has no interest in curtailing Western free speech, but it’s entirely happy to make money from it. And I'm not so naive as to believe that investing in the stewards of openness will make Tencent itself more open. And rather than being deplorable, I think it’s a perfect match that once again highlights the dichotomy between Chinese and foreign approaches to the internet. It’s the U.S. companies – Alphabet Inc., Facebook Inc., Twitter Inc. – that face the real Faustian bargain, having considered entering China (and all they would need to give up to do so) after building their brands on the back of freedom. It’s on the pages of Reddit where such deals will be debated and scorned by a world that rails against oppression and believes in open dialogue. While Tencent’s investors will get to enjoy the spoils of such passionate discussion, it’s a pity that its users won’t. (1) The whole round was $300 million, giving Reddit a $3 billion valuation. Tencent is just one of the participants.